Combining the award-winning design of the INNO CXT with the trusted nature of a more traditional material, aluminum, the new INNO AXT is a premier competitor riser. It weighs 1330 grams and feels heaver in the hand. The INNO AXT is still very stable to shoot, because that weight is so well balanced. 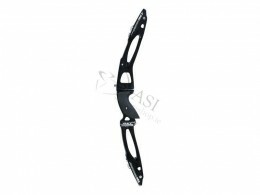 It is perfect for archers who prefer the confident feel of metal when they pick up their bow.